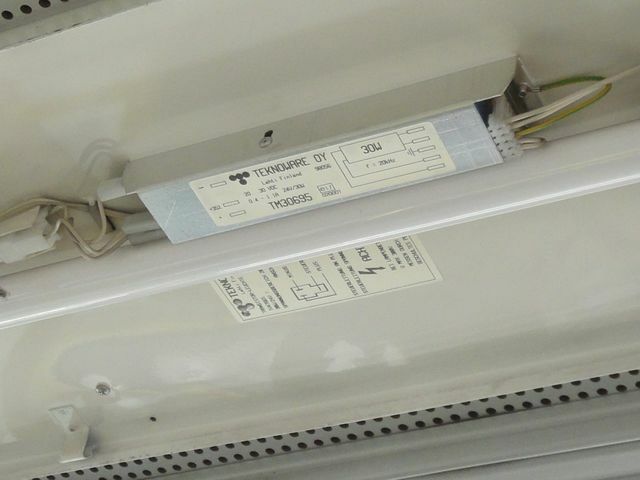 High frequency electronic ballast for 24V DC designed for use in bus interior lighting (in this case it was a Neoplan N4007 bus). This ballast has a dimming feature, different buses have different configurations of the number of dimmed tubes and different triggers that enable dimming. In some cases dimming can be enabled only by driver, in other cases tubes are dimmed when doors are closed and go full power when doors are opened. Mostly first tube behind the driver or two first tubes are connected to the mechanism of first door in order to not blind the driver during the ride and the rest of tubes is constantly at full power but in contrast Man Lion's City buses from Oslo have every tube in the bus dimmed when all doors are closed and opening of any door causes the switching to full power. At all of Egged buses here, that have fluorescent lighting, the lamps can be turned on and off, but not to be dimmed. Generally older Mercedes, Man and Neoplan buses didn't had dimming, it was a feature that became more popular since something like 1996 or 1997. In Man Lion's City buses it became a common thing (though there was a change from T8 tubes to T5 HE or HO). Obviously this is in case of fully original Man buses, those made in cooperation with some other company may be different in many aspects. Man NL263 made for BVG Berlin in 2001 have a system of dimming halogens in analogous way, though this is a unique case, I've not seen so far halogen dimming in buses made for other transport companies. Sometimes behind the driver there are halogens and further down the line there is a fluorescent fixture, when first doors are closed halogens are turned off and only the tube is dimmed. This configuration is much more common. Egged buses with fluorescent lighting includes MAN NL 313 and NG 363, Mercedes O404, O405 and O405G and Scania K270LE. The Mercedes O303 which was very popular in Egged, had incandescent lighting. All of these model were built here in Israel by Merkavim and Haargaz, in additional to the imported finished buses.